For as long as I can remember, I’ve been ob-sessed with the middle aisle in Aldi. If you don’t know what that is, a) what’s life like under that rock? and b) you’re majorly missing out. No, no, it’s not enough that I can get the best toastie bread in the world for 50p, Super Six fruit and veg, or the nappies the parents of Britain swear by (if they don’t, they lying). Nope, there has to be a visit to the middle aisle too. It’s wondrous. It’s bargain-filled. It’s perfectly seasonal. It’s full of everything from slow cookers to circular saws, full ski outfits to cheap school uniform, trampolines to dog beds. Most recently, something closer to my heart caught my eye. I noticed a tiny beauty section. Not much – in my local Aldi it featured BB cream, face wipes, concealer pens, face masks and the stunners I want to talk about today: mascara and micellar water. Black micellar water. Black, charcoal micellar water. I hadn’t even thought about charcoal micellar water as a viable concept – after all, we expect our micellar water to look like, well, water. This immediately intrigued me, then, along with the featured ingredients: along with charcoal powder, this cleanser contains bamboo and eucalyptus extracts, clay and coconut extract… basically everything that gets marketed to us as good things to use on our skin. The first time I used it, I immediately noticed how clean my face felt, both from the inside and to touch. The water itself does have a scent to it – not unpleasant or overpowering – so I did think oh, I am so gonna have a break-out in the morning. I was happily proved wrong! My skin felt just as clean the day after as it did the night before, and it actually provided a treatment of sorts to my existing spots, in that the redness and swelling was lessened and it seemed as if they were drying out. I went out the very next day to purchase another bottle of this stuff, as it feels as if I’ve left my old Garnier micellar water behind and replaced it with this. I took it upon myself to check out the reviews on the Aldi website itself and it seems I’m not alone – it’s basically the best micellar water I’ve ever used. The other thing I picked up was a mascara, which paired with its pink and green buddy on the shelf, reminded me a lot of its big sister Maybelline’s products. (They’re not related… at all… just extremely similar in appearance. Tell me there’s someone out there that has seen the Mitosis is… episode of Sabrina the Teenage Witch?! No? When she magics up the fake snacks to study with Harvey? Does Aldi not remind you of that episode? Please? Someone? ANYONE?!) 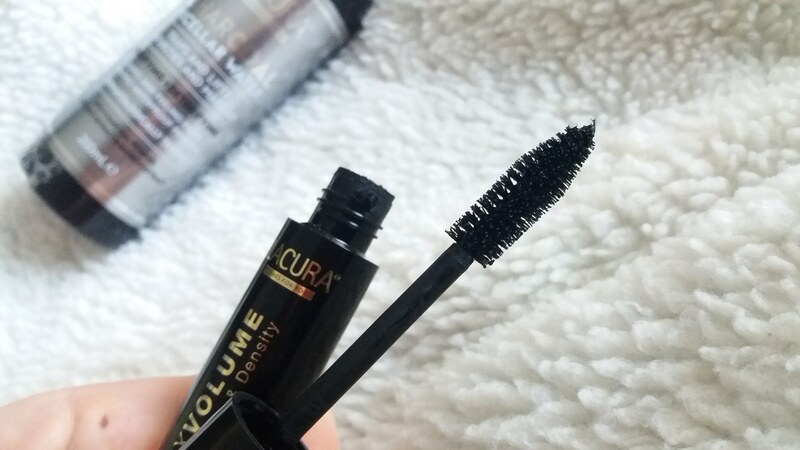 I went for the Lacura Mascara Max Volume. I was impressed with the size and feel of the wand, impressed with the formula of the mascara, impressed with application – lifting, volumising, lengthening – and impressed with the longevity of the mascara. Overall I’m super happy with the purchase and just hope Aldi keep their little beauty bits as permanent fixtures! Unfortunately the mascara isn’t available to purchase online, but retails at £2.69 in-store. You can check it out nonetheless here. I don’t wear false lashes, erm, ever, so it’s really important for me to find a great mascara. If you’ve been reading a while, you’ll know I was obsessed with a Maybelline mascara – swore by it, in fact. But if a great mascara is available for £2.69, why not half the money you spend on it? Interestingly on the Aldi website, some beauty products feature the cruelty-free bunny: namely their pink clay face mask. Unfortunately the products I’ve spoken about today do not, however it’s a fabulous step in the right direction that the supermarket is endeavouring to feature them! Previous What are you writing?